Jennie Guy is an artist and curator based in Dublin, Ireland. Her practice embraces visual, textual, performance, and event-based output, initiating both formal and informal collaborations and participative environments. These situations act as mirrors that destabilize the intent of both the creator and the observer, complicating notions of self, community, and the rituals surrounding artistic production, seeking new modes of observation and response. She holds a Masters in Visual Arts Practices, IADT, Dunlaoghaire, Dublin and a Bachelor of Arts in English Literature & History, Trinity College Dublin. She is currently an associate researcher with the Graduate School of Creative Arts and Media (GradCAM). Jennie Guy and I have been having an ongoing dialogue for a number of years now around our interest in contemporary art practice within formal and informal education. We have been attempting to get together as an informal reading group to share ideas and to learn from current thinking and practices in the field. Jennie and I have co-curated workshops and participatory installations or at least shared our ideas /practices, as we seem to have overlapping aesthetic and curatorial approaches (when working freelance it helps to have that common language and support outside of the institutional framework). We have also been in dialogue with Dr. Aislinn O’Donnell (Mary Immaculate College of Education, UL) around pedagogy and contemporary practice. I met up with Jennie to chat more about her work and what she sees for the future. KF: When did an interest in pedagogy and curating contemporary art in schools enter into your practice? And why did you begin to work in this context? I’ve always been interested in education. For example, my special Leaving Certificate history project question gave a focus to Patrick Pearse’s text The Murder Machine, and St. Enda’s, the school that he set up with his brother. So fast-forward a few decades, it’s no surprise to me really that my curatorial practice still takes a critical look at educational structures. Another reason is that I find working with primary and secondary students alongside artist peers an incredibly positive place. KF: How does this relate to your practice as a visual artist? This is a good question but something that I’m not sure I can answer ... yet. In a sense my recent art projects are not overtly connected to my educational curatorial practice. I think if I am asked this question again in say a year, I will have a much more articulate answer. I can feel the answer forming in the back of my mind but it is not worded as such. In saying this I look to practices such as Sarah Pierce’s collaboration with Annie Fletcher, The Paraeducation Department, with huge respect. Sarah makes it her art practice to develop these structures that are at once an artist’s work and dually something that fits into other realms. KF: Could you talk about your work to date, specifically within the primary school context? Perhaps you could describe the different one-off and longer-term projects. I have just finished a project in Willow Park, a boys’ primary school in Co. Dublin, as part of an Arts Week. This was an exciting first where the challenge was to come up with a series of workshops (24 in total) over three days. The school was adamant that the whole school experience connect with the artists I selected to work with (Karl Burke, Rhona Byrne, Hannah Fitz and Jane Fogarty). Workshops were short, only one hour each. However, because each artist was given the space to reflect on what aspect of their practice they would present and workshop, and also because there was a huge willingness on the part of the parents council, what initially seemed like quite an impossible endeavour became quite a seamless exciting deliverable. As a result the students were exposed to the most beautifully engaging art workshops. The students documented the workshops in their weekly online journal, the artists were interviewed and the more process-based workshops were documented really well too. The thematic I had initially put in place was that the school and students were welcoming and gracious hosts to these artists as nomads and this really proved apparent over the past few days. Overhearing positive snippets of conversations from the children about how much they were enjoying the workshops was great. Also, the instant feedback from the teachers is really important to me, as we have to understand that this isn’t always a usual addition to a teacher’s schedule. I guess what I need to emphasise is that each workshop or residency series in a school is always going to be different - and rightly so. I am happy that each time I work with a new school, the territory is somewhat unfamiliar and vibrant. I’m currently designing a two-day workshop series in Roscommon as part of Linda Shevlin’s curator-in-residence with Roscommon County Council where the workshops will be longer, therefore the contact time between the artist and the students will be that bit deeper. The ultimate goal is always to set up a residency where there is a sustained contact between an artist and a group of students. A colleague gave me wonderful advice a few years ago when she warned of the pitfalls of trying to overly programmatise workshops and residencies. I have taken this advice and run with it as fast as I can. The downfall is that attempting to describe to a school / parent body / funder what will happen in a residency / workshop series can be tricky. There is a difference between being able to give a literal example of what will happen in a workshop or residency and a more process-oriented description. Each time I complete a project it creates its own chain reaction that so far I have found to be only positive. KF: What has been the most surprising moment to date? I am still surprised every time I am approached to do a project or simply open a conversation. When I first started out with this type of work it was me who was doing all the approaching so it’s rewarding to see that full circles are beginning to emerge. Being invited to Áras an Uachtaráin to be part of President Michael D. Higgins Ethics Initiative was a big surprise. It was quite encouraging to know that the work that I am pursuing is being identified as relevant within such a framework, as it extends beyond the usual parameters of cultural production and links to other professional working contexts. 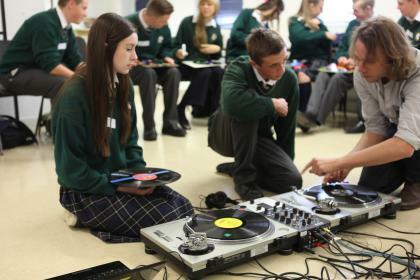 Image shown: Sven Anderson working with transition year students with prepared vinyl, creating an audio collage out of locked grooves. Records sourced from St. Vincent de Paul on Sean MacDermott St and prepared with blades and electrical tape. KF: What, in your opinion, are the challenges with bringing contemporary art practice into educational contexts? I think there is an excitement in the air around culture and arts but very occasionally it’s not so deep. A school or significant partner with a school might say they want an arts-rich experience in a school but then when it happens they don’t value it. I’m always glad to hear honest feedback, as it reveals a dialogue about considering what is and what isn’t contemporary visual art. Generally though schools are very open, excited and intrigued about learning what the artist will do in a workshop or residency that is coming up. Working with cultural practitioners who understand what I do and are willing to support me is such a positive experience. For example, I have a lot to thank Jenny Sherwin for in Wicklow County Council, as well as Niamh O’Donnell in the Mermaid Arts Centre as they have structured Thinking Visual (Wicklow County Council’s education programme) to support a practitioner such as myself and can see the benefit to all involved. I think that it’s important to realise how empowering it can be when those of us who are working independently take the time to express these moments in which an authority takes an extra step in supporting our efforts. 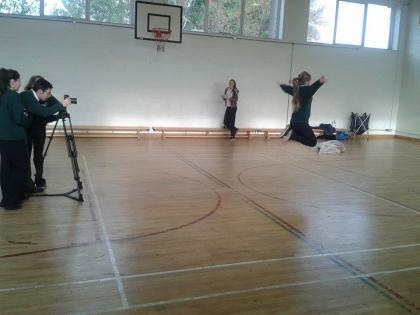 Image shown: Still from experimental moving image work; artist John Beattie in collaboration with Transition year students in Blessington Community College (BCC), made in partnership with Wicklow County Council’s Thinking Visual schools programme. KF: When working in schools you talk about the importance of the role of the curator within that context; why do you see it important for this ongoing dialogue/ contribution? Many artists work with a curator on one level or another, sometimes conceptually, sometimes more as a liaison and so on. Whether the work of the artist is situated in a gallery, museum, site-specific or (in my case) an educational context, this relationship between the artist and the curator remains extremely relevant. It seems like a paradigm shift because there isn’t a tradition of a curator working in schools with an artist. I am trying to demonstrate the value of establishing such a tradition, because, in my experience, if a project is developed like this, a lot more gets taken care of and the experience for the student, teacher and the artist goes that bit deeper. KF: Who are your biggest influences and who are you most inspired by? Every artist that I collaborate with on workshops and residencies inspires me. Each artist that I work with responds differently, but in a way that is inherent to his or her practice. I am inspired by all the relationships that I am fostering with other curators, arts officers, teachers, principals, and parents. I am inspired by the future arc of this project. Most of all I am inspired by the students’ engagement. KF: You recently curated a residency in Blessington Secondary School, with Transition Year pupils. What was different about working in a secondary school context? There actually isn’t a huge difference. Yes, there are specifics regarding age but once a residency starts and the basics are covered it becomes its own entity. One remarkable thing is that only some of the students in Transition Year actually do art while the remainder do not. So far this has proved beneficial; it frees the artist to work with a topic or an area of practice. Image shown: Guided by artist John Beattie, TY Students explore various methodologies of production, with the use of still & moving image, using the site of the school. Still taken by TY student. 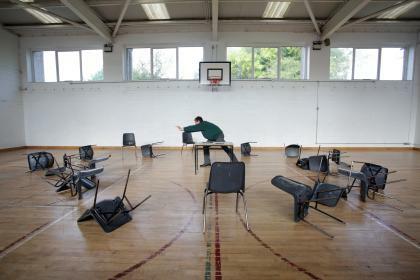 KF: What’s next for you and what do you think / hope is next for Ireland in the field of contemporary art in education? I’m currently evolving two substantial residencies in Co. Wicklow that will begin in the autumn-winter term. The first is in Blessington Community College and will involve artists Sarah Pierce and Elaine Leader working with Transition Year students. The second will take place in Colaiste Chongail in Baltinglass. I’m still talking to two visual artists and a writer about this one so we will have to watch this space. I’m very excited about this residency and the form it will take. I’m also hoping to take part in an educational fellowship programme in Berlin later this year in the NODE centre for Curatorial Studies. In terms of the larger Irish context, due to the recent Arts in Education Charter there is a shift happening in Irish curricula; more specifically, in my case, I would like to see support in this re-negotiation of the educational frameworks for independent initiatives such as my own as it creates a necessary feedback-loop between the establishment and the independent. To comment this interview you must be logged.